28ct. 'Icon' Lugana (stitched 2 over 2) from Picture This Plus. Stitched with Carrie's Creation Hand-dyed floss 'Peacock' and 'Sublime'. 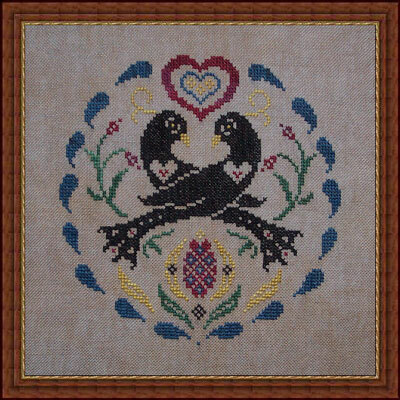 Stitch count is 91 w x 89 h.
'Friendship' in traditional colors stitched on 'Ale' cashel linen with Carrie's Creation Hand-dyed floss. The DMC conversion is listed on the chart for the Traditional color palette. Challenge your imagination by stitching this design to your personal taste. 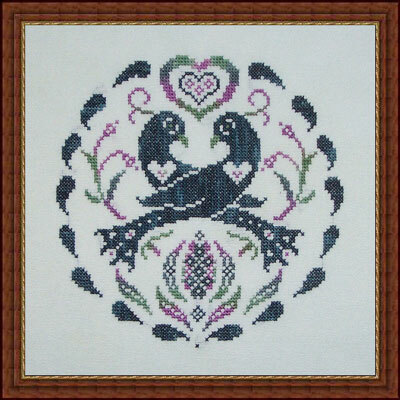 This design contains all whole stitches and is easily converted to needlepoint. copyright © 2008 Whispered by the Wind, LLC.